Several species of ticks carry serious diseases. Ticks carry diseases that can kill your dog, and even a few can be dangerous, as they can cause ehrlichia, anemia and Lyme disease. Always consult your vet if your dog has a problem with parasites. If she approves a natural shampoo as part of the treatment, scrub away. Pennyroyal is known to be effective in repelling ticks and fleas. Also called a mosquito or flea plant, pennyroyal is a fragrant, rounded, purple-flowering plant that blooms in late summer. It grows in parts of the northeastern United States and Canada. Products containing essence of pennyroyal can be found at most herbal and health food stores and online. To use against ticks, first bathe your dog in a regular mild shampoo and rinse thoroughly. Steep pennyroyal in hot water and allow it to cool until it is a strong tea, and pour it over your dog's freshly washed coat. Pennyroyal should never be ingested, so keep the solution away from your dog's nose and mouth. Neem oil, from the seeds of the neem tree, has been shown to be effective as a pesticide. It is one of the main elements of many flea and tick shampoos developed for use on companion animals. It works by interfering with the parasite's ability to reproduce and acts as a powerful flea and tick repellent. Over-the-counter shampoos containing neem oils are effective in protecting your dog from ticks and fleas. You can also make your own shampoo with a few drops of neem oil, some mild shampoo and water. Other essential oils can be used full strength directly on the ticks just before treating your dog to a warm, mild dog shampoo. 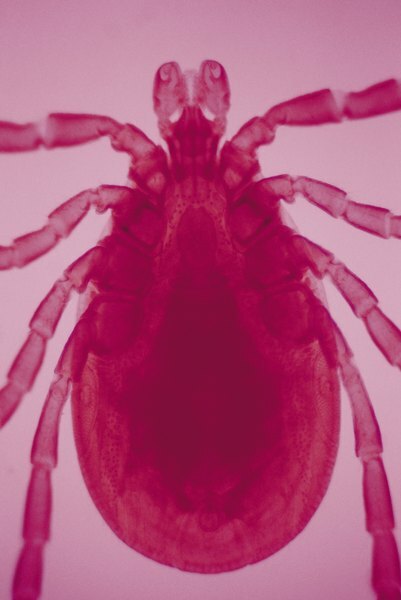 Geranium, palo santo, rosewood, thyme, myrrh, peppermint and juniper essential oils are all effective in removing ticks, and have anti-infectious and anti-inflammatory properties. Simply place a few drops of one of these strong oils directly on the tick and allow it to soak in, giving the tick time to back out. Once the tick has backed out, remove it with a tweezer and discard in a shot glass of rubbing alcohol. Then bathe your dog with a mild shampoo as usual. Many natural shampoos can be found at pet supply stores and on the Internet. These products contain D-limonene, an essential oil derived from citrus oil, as well as other products to deodorize and soften the dog's coat. Lanolin, cinnamon oil, cedar oil, clove oil and vanillin are also commonly used in tick and flea shampoos and will not only keep your dog bug-free, but make his coat soft, clean and shiny as well. Can Ticks Cause Anemia in Cats?